Greetings friends of Greyhawk! Today I'm going to try something out. After recently musing about one-sided battles with Istus and Ulaa, I started thinking about the unique magic items belonging to the gods of Oerth. Well, for the most part they are actually relics and artifacts of which no mortal could hope to copy. Time and again though, some of these magic items fall into the hands of PCs either by accident or by design. One such artifact is the Kanteel of the Oldest, the musical instrument of the "Laughing Rogue" Olidammara, god of wine, rogues and revelry. A kanteel (actually spelled kantele) is a Finnish/Karelian stringed instrument. The information below is my attempt at a 5E conversion. Enjoy! The Kanteel of the Oldest is an exemplary example of its kind, vastly superior to even an instrument of the bards in every way. A creature that attempts to play the Kanteel without being attuned to it must succeed on a DC 20 Wisdom saving throw of take 4d4 psychic damage. Spells. You can use an action to play the Kanteel and cast one of the following spells (save DC 18) from it: calm emotions, charm person (as 3rd level version), charm monster* (as 6th level version), creation (as 6th level version), dispel magic, fog cloud, legend lore or programmed illusion. Once the Kanteel has been used to cast a spell, you can't cast that spell again from it until the next dawn. Easy Come. Olidammara occasionally lends this artifact to mortals or allows it to be stolen for a time. While the Kanteel is on your person, any spell slot you expend to cast a bard spell counts as a spell slot of one level higher. Easy Go. Ownership of the Kanteel is always temporary. Olidammara can call the Kanteel of the Oldest to his person at any time, even across planar barriers. When the Kanteel vanishes, you receive a permanent Blessing from Olidammara (see DMG page 227). Destroying the Kanteel. While this instrument looks fragile and ancient, it is impervious to all damage and magic, short of that caused by another artifact. Usually Olidammara will summon his Kanteel back to his hand should anyone manage to scratch it. Bardic lore says the Kanteel's strings will break permanently if it is played in front of an audience of three or more unappreciative demon-lords or arch-devils. Greeting Greyhawkers! Today's subject is one that has come up in my home games in the recent past. Where does my new character come from? New gamers, unfamiliar with the geography and history of the Flanaess will not have the slightest idea where to establish their character's home land. The 1983 World of Greyhawk boxed set conveniently solves this with some random tables based on fantasy races. One is for humans and the other is for demi-humans (elves, dwarves etc). You'll have to find these charts yourself, but for an example here is one I did recently for tieflings and dragonborn in Greyhawk. It can be daunting to choose a homeland and build a backstory, so this guide below will help you pick one much quicker since instead of ethnic birthplaces or somewhere based on alignment, I'm selecting the most common areas of the Flanaess based on character class. 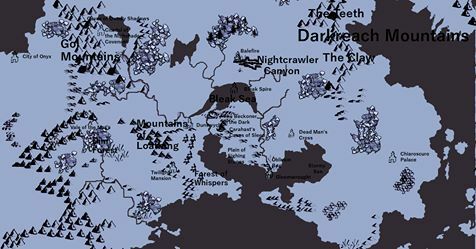 If you want to be more specific later on then wonderful, but for a new Greyhawk enthusiast, this can get you started much faster and will take less explaining at game time. When in doubt, the City of Greyhawk is always a good choice for a birthplace because it is central to the setting map. Everything else below is in one of four quadrants from this middle point. Note, the nations below are from CY 576 timeline. Welcome back Greyhawkers. 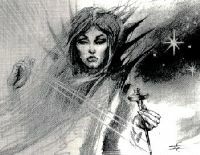 Following up on my last post about battling Istus, I'm going to have some fun discussing the same scenario with Ulaa, the Stonewife a Greater Deity first seen in the original World of Greyhawk Guide. Ulaa (pronounced OO-lah) is the goddess of Hills, Mountains and Gemstones. She has an uncertain origin, appearing to have traits of human, dwarf and gnome alike. Ulaa is also the wife of Bleredd god of mines, metals and smiths, a nice synergy because in AD&D rules she is very tough. To recap from last time: in the old days of AD&D, PCs could potentially take on gods (despite what canon says about gods staying off Oerth). The 1E Deities & Demigods was first to give stats and rules on the powers of immortals, later referred to as avatars in the Greyhawk Adventures sourcebook which gave players a better chance to somehow prevail over a deity in combat. That said we are going with the full-power Ulaa in the boxed set; let's examine how hard it will be to cut down the goddess of gems in battle. 2. A hammer of thunderbolts named Skull Ringer which is the meanest weapon in the game. Ulaa can throw this weapon every other round. so the pick does get some love. It's important to note how deadly this hammer is when hurled; Skull Ringer will instantly kill giant-kin and golems if thrown and against small/medium humanoids it will instantly kill as many HD worth as there is damage. So if Ulaa is fighting pesky orcs, she can kill 25 in one throw (not sure how that works in D&D rules, like an area of effect? ), or instead, pretty much annihilate your 25th level fighter in one hit. No save. Earthquake: One of the sickest cleric spells in AD&D. Among its devastating effects, it opens a crack in the ground that can possibly insta-kill your character. 1 in 4 for small and 1 in 6 for medium. Good luck! Dig and Move Earth: In case the earthquake didn't get you the first time I suppose? Wall of Stone, Stone Shape and Passwall: So she can avoid your attacks you know, then open a hole to throw Skull Ringer at someone or just pass through and use that military pick for fun. Summon Earth Elemental: Of course a goddess of earth would have an elemental buddy. This one is 24 HD. Don't think of turning him against her either, harmful elementals flee in terror from Ulaa. There you have it adventurers, respect and run away from Ulaa. She is definitely an under-appreciated, underestimated deity in Greyhawk publication. As written, Ulaa sounds like she has more in common with Thor than Bleredd. Hm, now there's a thought! Greetings fans of Greyhawk. Today I'm going to muse about Istus, the Lady of Fate, Great Deity of the World of Greyhawk pantheon. Istus is pivotal not only to the destiny of heroes as her portfolio and the module Fate of Istus would suggest, but she is also a mean combatant according to the 83 Boxed Set. 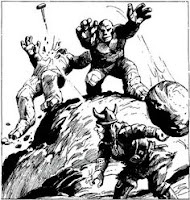 Back in the days of AD&D, it was entirely possible for PCs to take on gods. 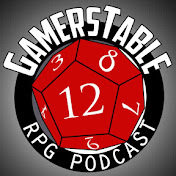 The 1E Deities & Demigods is loaded with stats and rules on the powers of these beings. This template carried over to the early Greyhawk products and articles thus giving the DM an option if divine wrath ever needed to be carried out. These gods were damn tough but not impossible to kill. Hit points capped out at 400, AC never went higher than -10 (AC 30 by today's rules, thanks Matrox*) and most had very high magic resistances. Let's examine how ridiculous it is to tempt fate herself in combat. Istus resides on her own pocket plane most of the time, but when on the Prime Material Plane she assumes various forms from ancient crone to noble lady to simple shepherd girl. While amongst mortals, Istus never carries an obvious weapon, though her spindle, from which she creates her webs of fate is her true weapon. Despite this, any object she uses always hits; she controls fate after all. So yes, she could kill you with a cloak pin. Also, forget trying to sneak up on this little girl, she is the goddess of future events, she already knows whether you're attacking or not. Provided you are still persistent enough to push Istus, her spindle has the following powers (insert your own rules). Strand of Binding: You're trapped in iron chains. Istus is being nice. Strand of Cancellation: Your favorite magic item? Never existed. Even artifacts are only partially affected. Strand of Death: I like to think of this one as rapidly aging your character 1,000,000 years instantly. Strand of Hostility: Suddenly its your destiny to protect Istus, even against your friends. Yikes. Strand of Passage: Pesky hero, let's send you away to the Plane of Shadow, or the Ethereal Plane, or heck, Faerun. Strand of Sending: She's feeling nice and just sends you several years into the future. Web of Enmeshment: Whoa you're trapped in a maze of your own mind! Web of Entropy: Great! Now she's just drained all your magic and spells in this area. Web of Stars: This one transports everyone including Istus to her bizarre homeplane of webs and starry portals. Good luck finding your way out unless you are a genius level intellect. So Istus basically toys with opponents or outright slays them. Even if you got a few hits in, she has 377 hit points (a ton in 1E terms) and is only harmed by +4 weapons. Even if you loaded up with big blades like the Sword of Kas and Blackrazor, she can once per day move into the future and back to heal herself. Congratulations for making it this far foolhardy adventurer. It is lastly mentioned she is served by a strange companion, a time elemental prince. As far as I know this type of creature doesn't exist in any other D&D rules, so I expect it can do all the above and then some. (*and now I know they do, thanks ProfArmitage, see comments below) Perhaps your PCs should pick on someone else easier, say Hextor or Erythnul. Hello Greyhawkers, Gen Con 2018 was last week and I of course missed out on a chance for some meet-ups and gaming. I know DMShane and many fine players and fans from the Greyhawk Channel were there as I sadly followed the event on Twitter. My friend Carlos Lising was also at Indy. running some old school Greyhawk that he previewed at last GaryCon in Wisconsin. With so much hype in the community lately I'm hoping to not miss out on GenCon 2019. I'm anxious to see some new faces and hear about their Greyhawk experiences. To that end I am already prepared for GaryCon 2019, where I will invite any and all fans of the Greyhawk setting to track me down to hang out with the likes of Carlos, Scott Casper and more (or head to Black Blade Publishing booth to see Greyhawk maven Allan "grodog" Grohe). As for GenCon 2018, since that just ended, have there been any good stories? What games were ran? What cool cosplays did you see? I'd love to know.